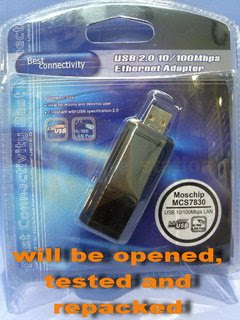 For the past few weeks I've noticed a number of USB to Ethernet Adapters being listed on eBay by a seller in Hong Kong - listing them as compatible with Vista, Linux, Mac. He's offering them under a number of seller IDs - but it's all the same guy - as verified through the "contact member" messaging system. This Document describes how to install MCS7830 USB Ethernet adapter Driver for MacOS X. This driver is for Mac OS X 10.X and has been tested on the following Mac versions. 2) It is a mess trying to translate broken English and get any support with these adapters. I offer full email and even phone support for my adapters. I've been selling these adapters for 8 years and I stand behind them working 100% with ANY MAC with every Apple operating system 9.2.2 or higher. 4) This adapter's drivers are unlicensed. You may be breaking copyright and licensing regulations if you use them. You most likely won't be prosecuted and I don't want this particular caveat to scare you - it's just something you should be aware of. If your driver ever becomes broken by an OS - say the new Mac OS X 10.6 Snow Leopard - I usually have a patch within a week to ten days. You will most likely NEVER get a patch from a seller in Hong Kong. 5) The seller is in Hong Kong - this means the FREE SHIPPING included will take 10 - 14 business days from payment to reach you. My FREE shipping is 1st class international and usually take 2-5 days US and 4-10 days international. Customs hold ups in your country and weather can sometimes extend those times - but that applies to Hong Kong sellers too. 6) Hong Kong sellers cannot obtain tracking or delivery confirmation. Once they've mailed an item, in their minds, you've received it ... end of story. With patience, I always make sure my customers receive their adapters either by tracking in USA or tracing internationally. If a problem with delivery arises, I send another out immediately! Thank you for reading ... I hope this helps in your decision to purchase an adapter if you need one.